Perform a full backup with iTunes! Especially if you’re trying to jailbreak your iPad – the whole procedure as well as Cydia on iPad is still considered beta. Then go to http://spiritjb.com/ and download the jailbreak application for Mac or Windows. The jailbreak itself is as easy as one single click. Now it occurred to me, that some security enthusiasts – and some folks at Microsoft – also advise people to choose random passwords for their accounts (computer, mail, social networking …) as well – to make it safe, of course. This is idiotic because the average user certainly does not want to memorize multiple random strings and this policy would encourage users to use one password for all their accounts. Using the same password for multiple accounts is a very bad idea – if one account gets compromised (the programmers at your dating site didn’t do a great job in securing their server) all your other accounts (PayPal, eBay, …) will be in danger, too. And even if you can memorize the random password there is a good chance that you will forget it once you haven’t used it in a while. Which is quite probable to happen since most people are too lazy to always type the password and decide to store it in Firefox, the keyring or whatever password manager they’re using. So don’t use random passwords as long as you’re not an autistic savant genious with a superhuman memory. Now, since I’ve condemned the really safe option of random passwords let’s have a look at the two possibilities an attacker has to crack your password. The first method would be a dictionary attack: The attacker uses a dictionary file with lots and lots of words in it as possible passwords. This attack is the reason why it’s a bad idea to use simple words without modification as passwords. The second method is a bit simpler, it’s called brute force attack. Similar to the dictionary attack the attacker tries to guess your password, this time – as the name suggests – every possible password is tried, starting with a and ending with ZZZZZZZZ… Brute force is a lot slower than a dictionary attack because obviously many more passwords have to be guessed until the right one is found. But the big advantage is that the password doesn’t have to be a word, so a password such as “123++” doesn’t offer a lot of protection against brute force attacks, despite being quite strong against a dictionary attack (always depending on the dictionary used, of course). So what properties does a password need to be safe? It should be long. The longer the better. Why not use a short sentence for example? A short sentence consisting of a few words is very easy to remember and contains a lot of characters, making it hard to break. In case spaces are not allowed you can just leave them out or substitute them with a dash or a certain number. It should contain upper and lowercase letters, numbers and special characters. Adding a number and a special character after your usual password vastly increases the security of your password. Let me show an example: if “monday” is your usual password, it consists of 10 lowercase letters. So a brute force attacker has to try a maximum of 246 possible passwords until he eventually will guess the right one. Given he can try 5000 passwords per second he will crack your password in about 10 hours (he would even be a lot faster if he used a dictionary attack in this example). Now we add a number and a special character to your password and capitalize the first letter: “#0nd4y” A brute forcer would have to try the full ASCII set to crack your password: 1286 which would, at the same speed, take the attacker almost 140 thousand years! As I already mentioned: One password per account! Don’t use the same password for multiple accounts. Just don’t. This way even if you don’t use a password for a long time you, and only you, will still be able to guess the right one amongst the most likely variations that you have in mind. And even though I certainly do not consider myself a security expert, I think this is one of the safest, most reliable ways to choose your passwords for everyday users. 3. Under software selection select OpenSSH server – for remote management of the machine – and manual package selection for the actual pptpd package. If you want more services, for example if you want to use the computer also as a webserver, you may of course select the additional software. For security reasons I generally advise people to only run one from the outside accessible service per machine if set up in a critical environment, but really that’s up to you. 4. In manual selection navigate to ‘not installed packages’ -> ‘net’ where you will find pptpd. Select it and press ‘g’ twice in order to install the package. 6. SSH into your newly set up machine and run ‘sudo aptitude update && sudo aptitude safe-upgrade’ first to update all packages. Reboot if necessary. 7. Open the pptpd.conf file: ‘sudo nano /etc/pptpd.conf‘ Adjust the IP settings at the bottom to your needs. Under local IP you enter the IP in the local network of your VPN server (if you don’t know it type ‘sudo ifconfig’ and it will show you your network interfaces and the assigned IPs). For that matter I recommend to set up a static IP in /etc/network/interfaces or in your router configuration. You may have to change ‘eth 0’ to another interface, depending on which interface is configured to connect to the internet on your machine. 13. In case your vpn-server doesn’t directly connect to the internet you may need to forward port 1723 TCP and GRE to the LAN IP of your vpn-server. Refer to your router’s manual or to portforward.com for vendor specific instructions. 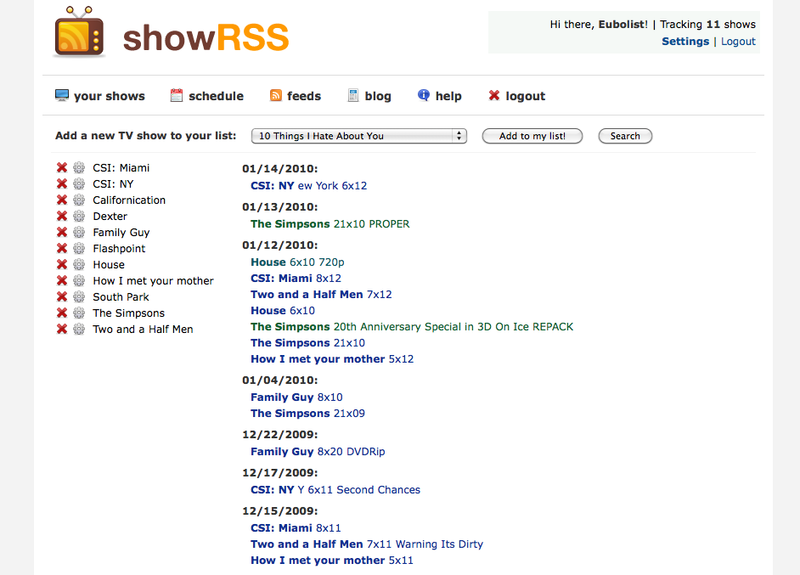 I found this awesome page where you can simply create a list from virtually all available TV shows, feed the URL to an RSS capable BitTorrent client and enjoy fully automatic downloads of the most recent episodes. 1.) Go to http://showrss.karmorra.info/ and create an account. 5.) Feed the link you are given to your favourite BitTorrent application. Personally I use Miro, but you can also use Vuze (formerly known as Azureus) or µTorrent. For a good list of BitTorrent clients and their features see Wikipedia.